Argh! My blog is so neglected. It’s the time of year where I’m cooking all the time. I’ve even kept up with the Cook the Book Fridays assignments. Alas, I’ve become an expert procrastinator when it’s time to write a blog post. So, without further ado, here goes. I was SO EXCITED to make Panisse Puffs. I can remember leafing through My Paris Kitchen when it first came out. 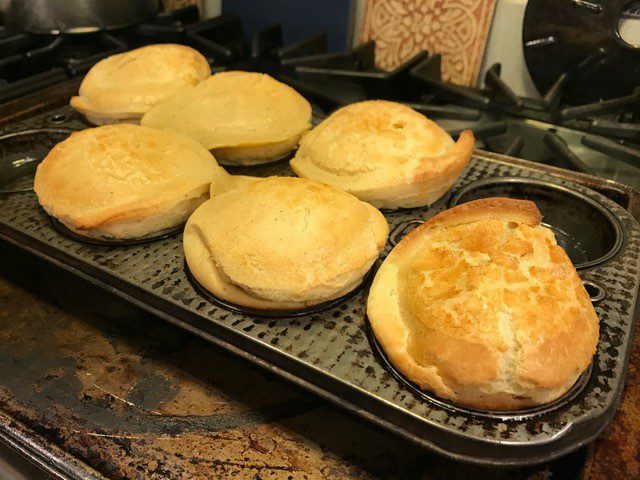 That must have been around the time I made popovers for a rare participation in Tuesdays with Dorie because I had popovers on the brain. It’s this recipe that tempted me to buy My Paris Kitchen. Of course, I never made them. When this recipe was selected for the Cook the Book Friday schedule, I finally had the motivation I needed, no excuses allowed. Again, I marveled at how simple popover batter is. A few staples whirred in the blender and it’s time to rock-and-roll. The pan preheats along with the oven, so the pan is buttered and then filled with batter when it’s blazing hot. The puffs puffed. What they didn’t do is get all that brown. I’ll admit that the glass window in my oven is not very easy to see through. After 35 minutes, the puffs looked brown, but I think the baked-on splatters disguised the true color. They also were stubborn about coming out of the pan. 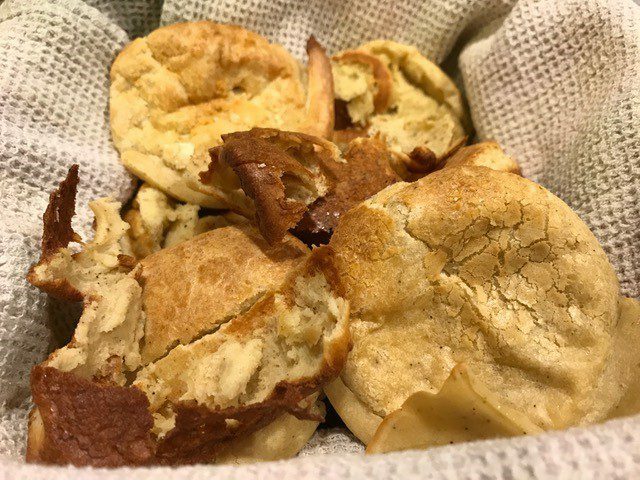 I used a muffin tin because I don’t have a special popover pan, though I’m not sure it would have made a difference. These looked much better in the pan. After prying them out, my puffs were rather disfigured and deflated, no longer “souffléed”. They tasted OK, but after years of anticipation, I was a little disappointed. Typically, I don’t make hot soup in the summer. Gazpacho, sure, and the occasional “other” cold soup, but little compels me to heat up the kitchen with or hang around to watch a simmering pot of soup. For these reasons, I was ambivalent about making vegetable soup with pesto. 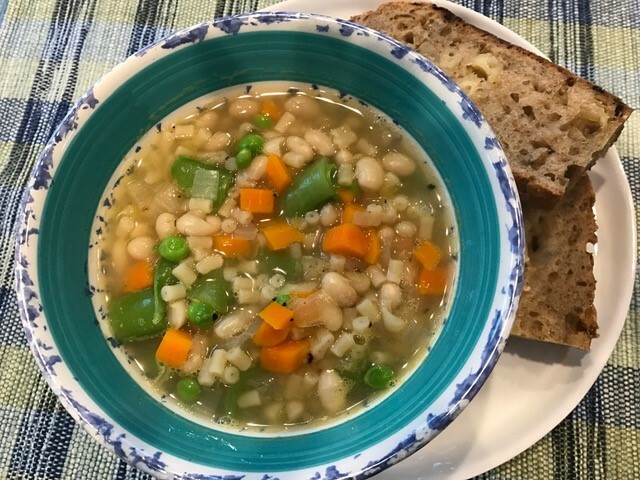 Trying to stay on schedule with the Cook the Book Fridays gang, I forced myself to soak white beans overnight and move ahead. As crazy as it seemed to me, this really is a summer vegetable soup. All the vegetables called for were part of my CSA share that week: carrots, zucchini, fresh sugar snap peas, and loads of basil. The beans simmered while I chopped everything else up. Vegetables were added in stages, depending on how long they needed to cook to tender. 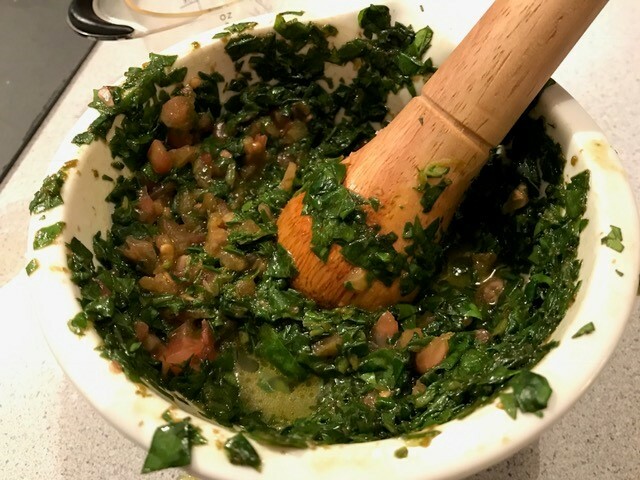 While the vegetables cooked, I made pistou (nut-less pesto) in my mortar and pestle. I’d never done that before, always using the power of the food processor instead of my own muscle. The result was much rougher but pleasing when dolloped on top of the soup. So, I was wrong to doubt the delight of a hot summer soup. This one was delicious. I’d even make it again with the vegetables of the week if the weather isn’t too hot outside. Pasta is not something I ever think to make myself. It seems intimidating, especially when making the dough by hand rather than in the food processor. I was home alone the night I made this, so I made a smaller batch. Always divide by the eggs, so I made 1/3 of the recipe. 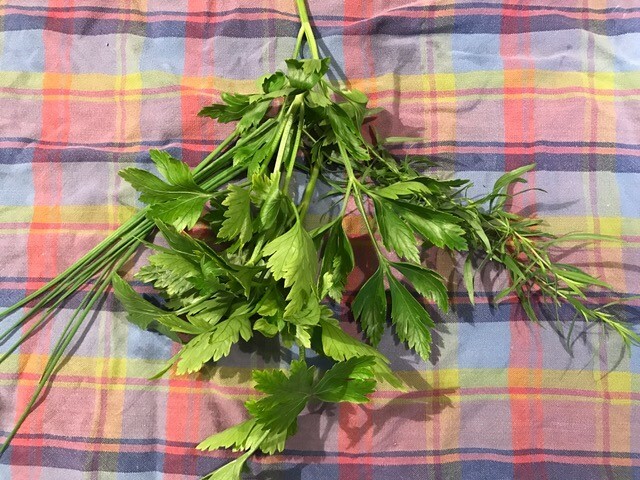 I used a variety of herbs from my garden and just followed the recipe. No tools required! I used my fingers to incorporate the eggs into the flour. 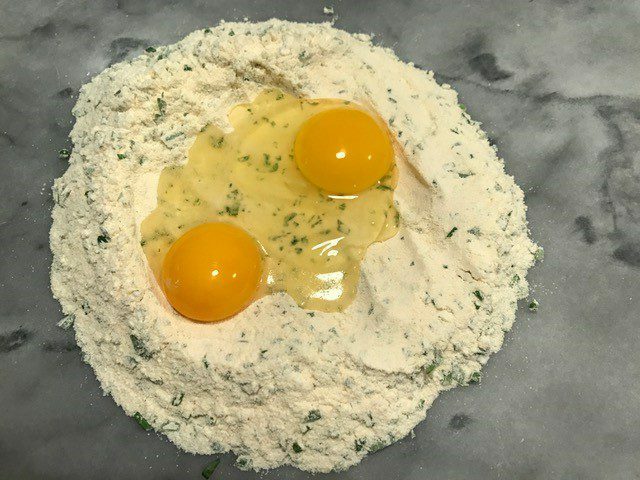 Once the eggs were absorbed, not all the flour was incorporated, so I kept sprinkling the dough with water until it all came together. It rested for about an hour before rolling it into sheets and then cutting the sheets into strands. I was surprised that the process was so easier than I expected. 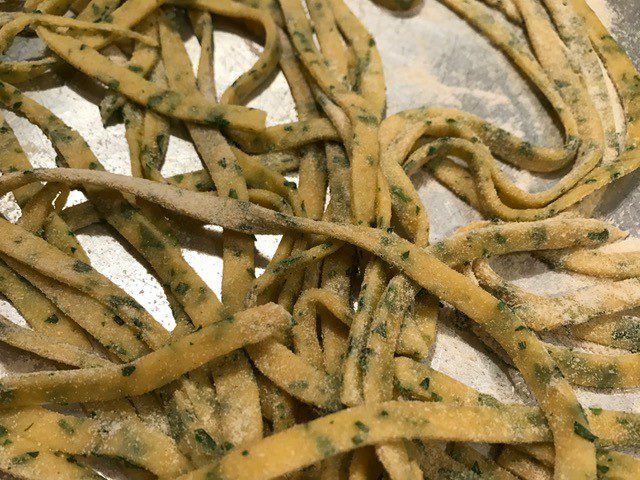 I don’t intend to wait another quarter century before the next time I attempt my own fresh pasta. 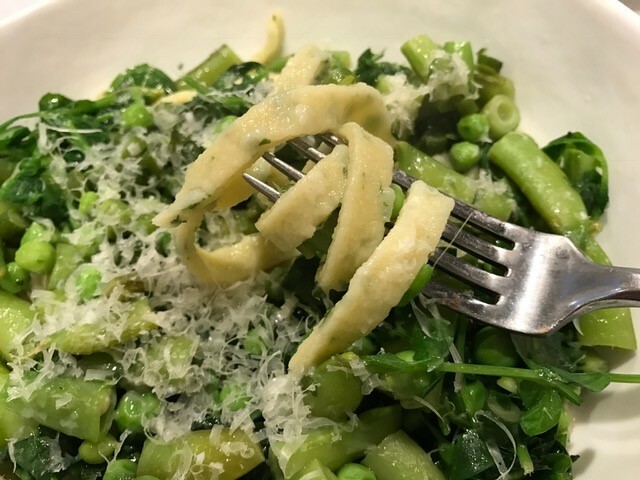 I made a mélange of pea tendrils, sugar snap peas, and shell peas to top the pasta for a seasonal spring meal (at least, seasonal in June, when I made this). Delicious! You can find all the recipes in David Lebovitz’s My Paris Kitchen. Panisse Puffs is on page 245, Soupe au Pistou on page 92, and Herbed Fresh Pasta on page 230. 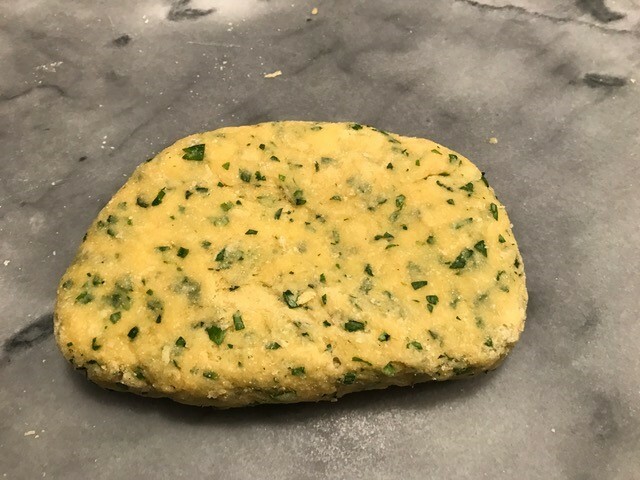 My friends at Cook the Book Fridays were more timely in their execution, but go back and check out their posts for Panisse Puffs, Soupe au Pistou, and Herbed Fresh Pasta. Posted on 24 July 2017, in Baking, Cook The Book Fridays, Eggs, my paris kitchen, Soup, Summer CSA and tagged Cook The Book Fridays, my paris kitchen, pasta, popovers, soup. Bookmark the permalink. 5 Comments. Betsy, your post made me laugh!!! I still have to blog about the soup that I made (yesterday!). It did make for a nice meal for friends and definitely was a good use for the basil inmy garden. I got rid of my chickpea flour, but maybe I need to source some more. Those puffs look fun! Happy to read of some of your cooking adventures!!! You did great with the three recipes! Love the look of your pistou, and your herby pasta. My pasta was a bit tough. Betsy, everything looks great. I enjoyed each of these recipes, and I was surprised that the pasta was so easy to prepare. When you post all three recipes at the same time, the story of your life, your personality and your humor are in full display. A very enjoyable read with delicious food to match. The puffs are equipment-dependent, at least we know the batter works. Great catch-up! I still have to make the pasta, but I plan on doing it soon and serving it with a garden tomato sauce.